She’s maintained her supermodel status in the fashion industry for over three decades. 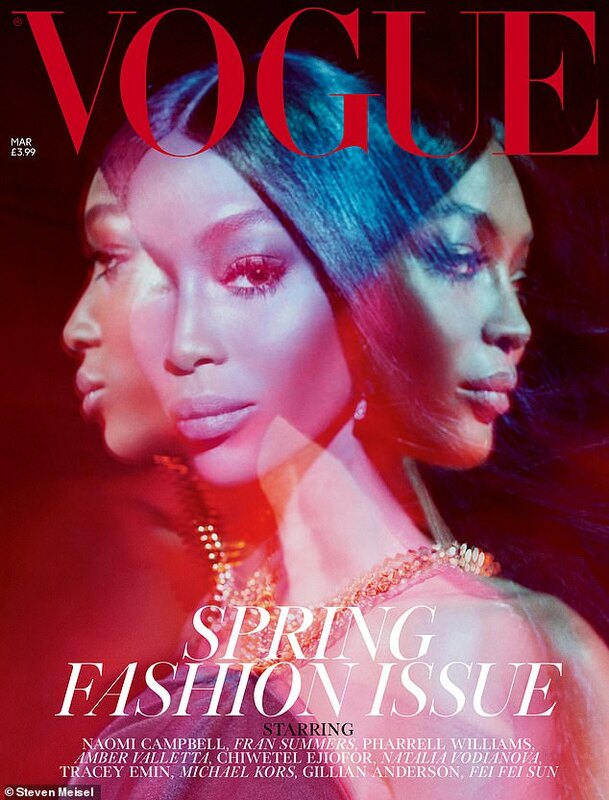 And Naomi Campbell commanded attention once again as she dazzled on the cover of British Vogue‘s Spring Issue, set for release in February. In one black-and-white image, the 48-year-old catwalk queen, who serves as a Contributing Editor for the publication, displayed her legendary modelling skills as she posed up a storm alongside a slew of hunky men. The Face star ensured she’d turn heads with her statement ensemble as she rocked a black one-shouldered playsuit, embellished with quirky feathered detailing along the neckline. Upping the style ante, the Streatham native boosted her physique in a pair of strappy peep-toe heels, featuring mesh bow ties. 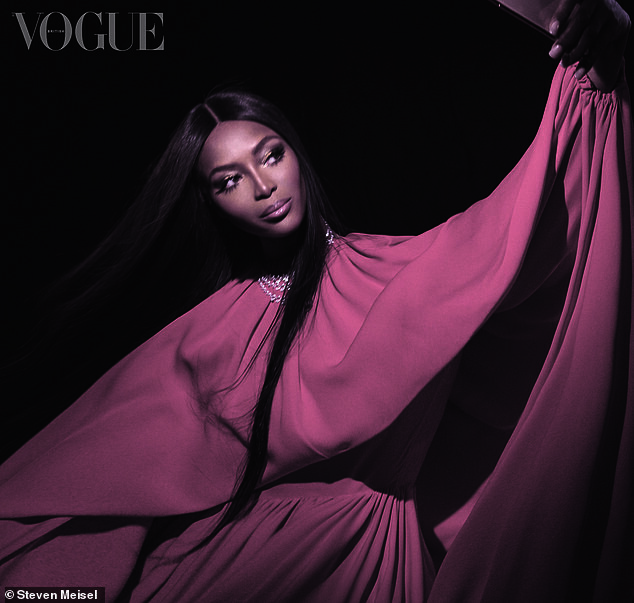 For another look, Naomi wowed in a pink billowing gown as she took a selfie on a mobile phone. The brunette complemented her appearance with glittery gold eyeshadow and framed her striking visage with poker straight tresses. In the publication’s March letter, Editor-In-Chief Edward Enninful detailed his first encounter with the supermodel. The fashion stylist, 46, recalled: ‘I was a young fashion director and Naomi was already famous well beyond the industry, but we bonded on sight. ‘After the shoot wrapped, she invited me to jump on a private plan to Dublin with her – I was due back in London and had only £10 in my pocket – but that’s just the way it is with Naomi. Hailing his close pal as a ‘fighter’, the Ghanaian-born star added: ‘There has been so much written about her over the years, but I think many would be surprised to discover how loyal and generous she is. Following over three decades in the industry, Edward also touched on Naomi’s fast-paced lifestyle: ‘With all the flashbulbs, the fashion, the entourages, the jets, the philanthropy, the red carpets and the world leaders on speed dial, she seems to live at twice the pace of the rest of us. See the full feature in the March issue of British Vogue, available on digital download and newsstands on Friday 1st February.